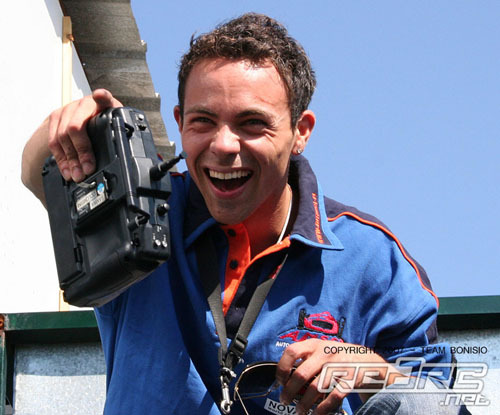 Red RC would like to announce that our live trackside coverage from the 2007 IFMAR 1/8th scale World Championships, in Argentina, has been kindly supported by Kyosho, Xceed RC Products, Serpent / Mega and R/C Car Magazine. We would ask that you support these companies because without them it would not have been possible to cover this event. Event coverage begins on Monday October 8th. 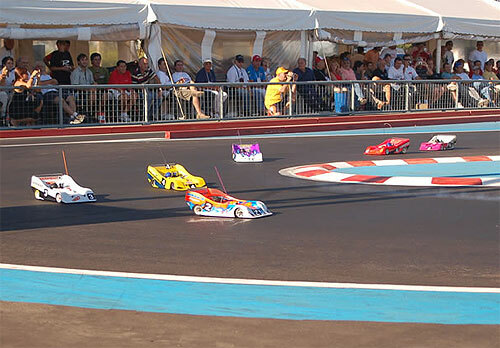 Argentina is the host country for the 2007 IFMAR 1/8th scale World Championships and as the elite of the RC World descend on the country’s 2nd city, Cordoba, we bring you our event preview. This year’s event takes place on a recently completed track at the Complejo Ferial Cordoba, the same venue as used by the Argentinean round of the World Rally Championships. Favourite for this years event has to be the 7-time World Champion Lamberto Collari of Italy, the Kyosho driver will be trying to further cement his legendary RC status with an 8th IFMAR World title. Lamberto was present at the warm-up race in March but despite a good qualifying he had radio problems in the final, which meant he retired after only 50 laps, a problem I’m sure that will be sorted in time for this year’s main event. The winner of that warm-up race was Mark Green, the English Serpent driver has been tearing up the tracks in the UK all year and with experience in World and European Championship Finals, Mark can surely be a strong contender for the crown. Another racer on the podium at that warm-up race was the charismatic Italian driver Dario Balestri, who as our coverage of this years European 1/10th scale Championships showed you can never discount him to make a come back. Supported by the Novarossi factory means that power will certainly not be a problem and as we know, his driving is up to scratch, with the only uncertainty being the performance of the so far largely unproven Motonica chassis on the International stage. Japan has produced some World Champions in the last few years of gas on road racing and as always they are strong contenders. Current 1/10th scale World Champion Keisuke Fukuda could be in with a strong chance for Mugen, the 2001 Vice Champion, has the experience of the big occasion and knows what it takes to win. Also from Japan with high hopes is former Japanese Champion and 2003 & 05 podium finisher, Takaaki Shimo, the Kyosho racer is always in or close the finals at the big races. The Sahashi brothers will also be there for Serpent, with Yuya having just won the Japanese Nationals, and Tadahiko placing 3rd, meaning that they are definitely not going there to be spectators. Another racer from Japan looking to get his hands on the silverware is Motonica racer Masao Tanaka, the Novarossi backed driver finished 3rd in 2001 and was in the final in 2005, so expect another strong performance this time around. Another number of drivers from Europe that could take the win would be Italy’s Danielle Ielasi for Kyosho, 2007 Italian Champion Alberto Picco also racing for Kyosho (UPDATE: Alberto will not be travelling to the event due to work commitments), another multiple finalist Walter Salemi for Mugen and Serpent driver Andrea Cristiani, expect all the Italian racers in the top 30 at this event. From Germany is multiple European Champion, Michael Salven for Serpent as well as previous Worlds finalist and current German National Champion Robert Pietsch, racing the Shepherd Velox. Finally from France, racing for Luxembourg, is multiple World Champion Adrien Bertin, the Kyosho racer will perhaps be debuting the CRF .21 motor at this event which is meant to have really good fuel consumption, important for 10 minute qualifiers. 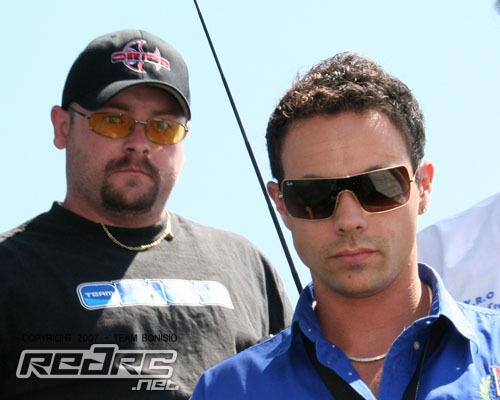 Finally from the USA there will be title contenders in the form of Kyosho drivers Chris Tosolini and Josh Cyrul, the latter recently switching to Novarossi engines, Mugen racer Mike Swauger and for Serpent, Paolo Morganti. All 4 drivers have been in winning form this year with Morganti going to the event with prior experience at this track, having taken part in a test session during the summer. Red RC will be live at the track from Monday the 8th and will carry on right up until Saturdays finals day with Red RC bringing you reports, insights and of course lots of photos directly from the track throughout the week. 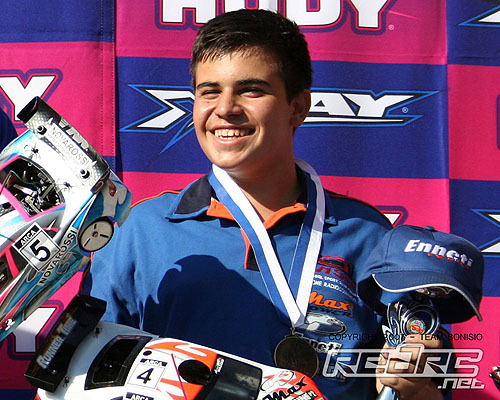 Dario Balestri, best described as rc racing’s answer to Valentio Rossi, has successfully defended his European 1:10 200mm Championship title in Madrid. While many may have ruled the young Italian out after he qualified just 26th fastest, Balestri pulled off one of the greatest title defences the sport has seen. Lining up in the 1/4 Finals due to his poor performance in Friday and Saturday’s heats the Team Magic driver finally found the set-up he had so desperately been seeking all week. Starting from fourth on the grid he quickly took charge of the 20 minute encounter winning by four seconds to bump up to the Semis and now Balestri had a real chance of keeping the crown he had won a year earlier in Heemstede, The Netherlands. Starting 8th on the grid in the Semi B, which had a quality line-up of drivers including Kyosho’s Adrien Bertin & Francesco Tironi, Serpent’s Mark Green and Xray’s Martin Christensen, the Novarossi supported driver was getting quicker and quicker as he fine tuned his G4’s settings. Storming through the field he made it win number two of the day beating Bertin to secure that all important place in the Main Final. With all of the sports five major manufacturers represented in the Main Final with 5 Xray, 2 Serpent, 1 Mugen, 1 Kyosho and 1 Team Magic, the stage was set for a titanic battle between established names and some of the sports emerging young stars. Top Qualifier Teemu Leino made the most of his No.1 starting position to lead the field but it was short lived and after just a few laps local ace and crowd favourite Oscar Cabezas got past the Finn and began opening up a comfortable lead. Coming up to the second round of pit stops the Serpent SDD driver’s car came to a halt, a costly mistiming of his pit stop resulting in his car running out of fuel and loosing 2 laps a terrible turn of luck for the man with the fastest lap of the championships . This allowed another young star and fellow 720 driver Alessio Mazzeo to take the lead. The current EC-B Champion in 1:10 200mm, the personable teenager has impressed so many people with his pace in Madrid. Keeping a cool head, Mazzeo was looking good as he led the way but double championship success was not to be as he started to struggle in the corners in the later half of the race. While all this was going on at the front Balestri had been cutting his way through the field and with the fastest car on the circuit he was now the new race leader a lead he would not relinquish to cross the finish line over a lap in front of runner up Jilles Groskamp of the Netherlands. Completing the podium Mazzeo was upbeat about his result, ‘The race was good and I finished on the podium. I’m happy, I’m very very happy. 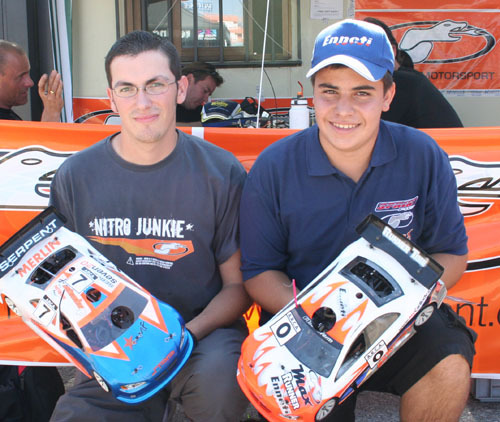 ‘ In addition to finishing third, the Italian was also crowned EFRA European Junior Champion, making it a remarkable year for the Serpent driver. One thing to come out of the 2007 EFRA Euros is the number of future stars that are emerging in our sport and this bides well for many more thrilling events like what was experience here in Madrid this week. Red RC would like to thank the AECAR and ARCA for their hospitality during the championships and in particular the timing crew who assisted us in bringing the huge number of site visitors coverage of what has been a thrilling 7 days of rc racing. Download the complete final results here (PDF). Qualifying list is also available here (PDF). The race is just over and the 2006 European 1/10th scale Champion Dario Balestri has retained his title after a great finals day that saw him move up from the quarter finals to claim a place in the final. The young Italian racer finished ahead of Xray racer Jilles Groskamp in 2nd with European B Champion Alessio Mazzeo finishing in 3rd. Pole position man Teemu Leino led for just a few laps and was quickly passed by Oscar Cabezas, who then led for close to 10 minutes until running out of fuel handed the lead to Alessio Mazzeo. A very fast Dario Balestri got past Mazzeo for the lead and never looked back and in the closing stages Mazzeo was passed by Jilles Groskamp who claimed the 2nd spot. View our updated image gallery here. Full report to follow soon. Reigning European Champion Dario Balestri is in flying form today in Madrid winning his Semi Final to give himself a chance at defending his title. The Italian Team Magic driver had struggled in qualifying but a change in car set-up this morning gave Balestri new found pace. Winning his Quarter final to line up 8th on the grid for the Semi B he went on to win the 20 minute encounter from Adrien Bertin and both now bump up to the Main Final. In the Semi A it was an Italian 1-2 with Xray driver Niki Duina winning from Giuseppe D’Angelo. The final two places in the Main Final go to Martin Hudy and Denmark’s Martin Christensen as the two fastest Semi times outside of the Top 2. Big names to fall by the wayside include Mark Green, runner up for the past two years, who suffered an engine cut out after rolling his Serpent early in the Semi B. 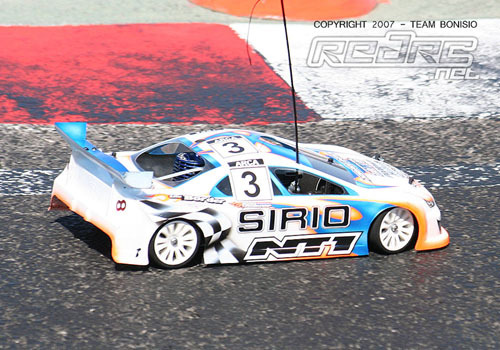 Another to go out at Semi stage was Sirio top man Francesco Tironi who hit a marshal resulting in damage to his Kyosho. Rick Vrielijnck didn’t get past the 1/4 Final after his fuel tank failed to seal correctly during his run. 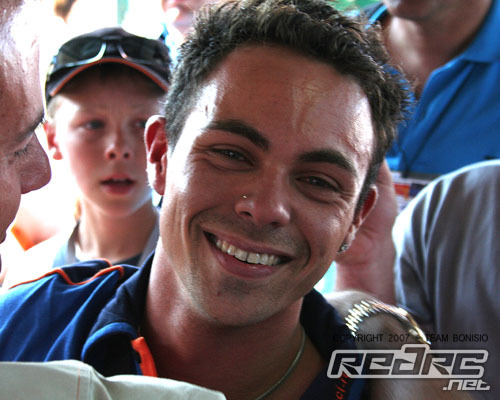 Multiple European Champion Michael Salven was elimated from the Semi A when his car was first spun by one car and then collected by the next forcing instant retirement for the German. 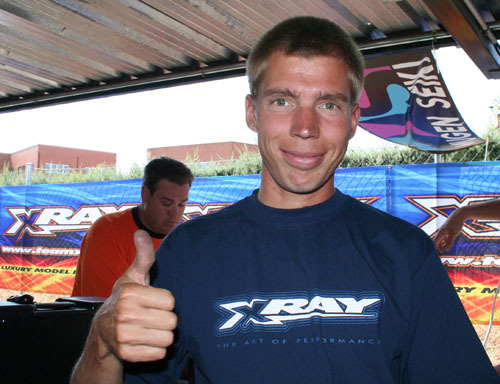 In a less dramatic that expected final round of qualifying for the 2007 EFRA 1:10 200mm European Championships in Madrid it is Teemu Leino who is the Top Qualifier. The flying Finn improved on his provisional overnight pole time by almost a second in this morning’s fourth and final heat but was never seriously challenged for the TQ time as the track conditions were much hotter than expected. Serpent’s Oscar Cabezas did improve his time as expected but it was not enough to deny Leino and Team Xray their first 1:10 Nitro European Championship TQ honours. Biggest improvement this morning came from Dutch driver Jilles Groskamp who improved his time by 4 second for third position and secures a place in Sunday’s all important Main Final. Making it two Xray’s and two Serpent’s that will occupy the front two rows of the grid, young Italian talent Alessio Mazzeo will line up fourth with his Max powered 720. Another major improver in the final heat was Britain’s Darren Johnson who broke into the 16 second laps for the first time and will start from pole for one of the Semi Finals as the leading Team Magic driver. Top Mugen starter is Italy’s Guiseppe D’Angelo who improved his time this morning to end up 7th fastest just ahead of Serpent’s Mark Green. Reigning European Champion Dario Balestri looks to have his work cut out for himself if he is to defend his title after qualifying a disastorous 26th. Others facing a challenge to make the Main Final are Michael Salven (13th), Martin Hudy (16th) and Rick Vrielijnck (23rd) .